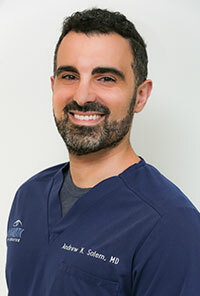 Dr. Andrew Salem was born and raised in San Diego, California. He graduated from the University of California, Los Angeles with a B.S. in Psychobiology and earned his Doctor of Medicine degree at Georgetown University School of Medicine in Washington, D.C. He completed an internship in Internal Medicine at Georgetown University Medical Center and an Ophthalmology residency at Tulane University in New Orleans. Dr. Salem also completed a Fellowship in Cornea, External Ocular Diseases, and Refractive Surgery at the world-renowned Jules Stein Eye Institute at UCLA. Dedicated to education, Dr. Salem has lent his expertise to underdeveloped countries by volunteering his surgical services and training local eye surgeons. He visited Cordoba, Mexico in 2015 for a surgical mission trip, where he joined a team of four surgeons to perform over 150 cataract surgeries on indigent patients. Dr. Salem was selected for the ASCRS foreign exchange program, where he spent a week in Verona, Italy training with Italian surgeons on the most advanced anterior segment surgical techniques. Dr. Salem has extensive training in astigmatism management and presbyopia correcting lens technology and is proud to offer the latest advancements in the field of cataract surgery. As a refractive surgery specialist, he also performs all-laser LASIK and Advanced Surface Ablation (ASA) in our state of the art laser suite, equipped with the WaveLight® FS200 Femtosecond Laser and the WaveLight® Allegretto Wave® Eye-Q Excimer Laser. Furthermore, he is skilled in the evaluation and treatment of glaucoma, macular degeneration, diabetic retinopathy, and other eye diseases.